Quality carburetor rebuild kits, choke pull offs, choke coils and floats for American carburetors. 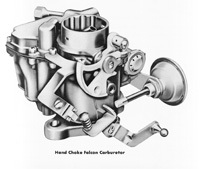 Holley used '1900' designations for several different series of unrelated carburetors. It had nothing in common with the 1904/1908/1920/1940/1960 series which featured a detachable float bowl. The 'Visiflow' series of carbs used a glass float bowl, but were otherwise similar to other 1904 carbs. The 1909 carburetor was another completely different carb used on AMC and Ford applications in the early 1960's, sometimes interchangeably with the Ford 1100 carb. 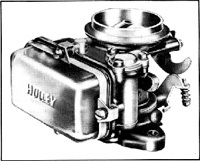 The Holley 1940, 1945 and 1946 carburetors were a new design in the late 1960's. They were used on Ford 4 and 6 cylinder engines into the 1980's, and on industrial applications well into the 1990's. The 6145 was a computer controlled, feedback version used in 1985 Ford 4 cylinder cars. Trademarks appearing on this site are the property of their respective owners. They appear here for identification purposes only. No endorsement by the trademark owners is to be construed. All prices are in US Dollars.